In early 1960s Mississippi – the sweltering scene of the vicious clashes of the Freedom Summer, the Ole Miss riot and the Freedom Rides – a young white man was becoming very interested in police surveillance cameras. Not because he wanted to campaign against unjust surveillance of the civil-rights movement, nor because he was interested in police methods, but because he was fascinated by how the cameras worked. William Eggleston’s friend in the local police force had managed to get him a roll of the film they used to capture incriminating activity. Lacking the correct camera to put it in, he retreated to his dark room and customised it so that it fitted into a commercially available spy camera. This meant not only trimming the film down to the correct width but cutting hundreds of tiny sprocket holes into it. The result was a series of intimate photographs of his family life, which are among the previously unseen pictures in the National Portrait Gallery’s new exhibition of his work. They sum up a paradox in one of America’s most famous photographers: surrounded by political turmoil he focussed his gaze inward on his family; a humane observer of people he is also an utterly obsessive technician. 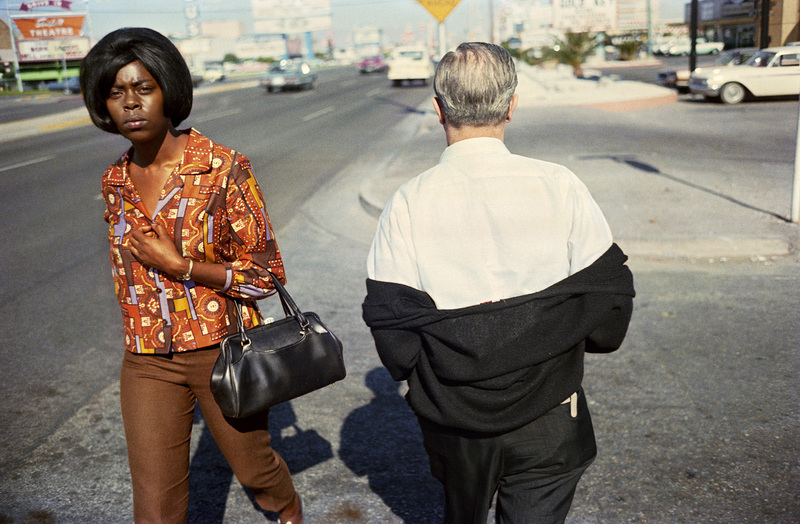 Refusing to be pinned down to any viewpoint or agenda, Eggleston’s greatest strength is his almost enraging ambiguity. 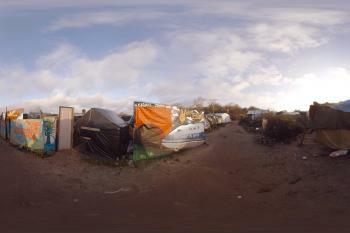 He is neither a sentimentalist nor a documentarian, neither subjective nor objective: he somehow captures that ephemeral moment we experience when we’re not quite sure why a memory sticks with us, why an otherwise mundane glance from a stranger seems to take on a greater significance. The unvarnished Americana for which he is so famous – brash logos and a hint of rust – can contain something uneasy, even threatening, precisely because Eggleston maintains a blithe poker-face about his feelings on his subjects. 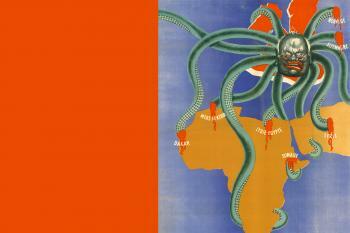 Walking through this exhibition is to meet more placards marked “Untitled” than you can handle. The names of previously anonymous sitters, revealed specially for this exhibition, are hardly likely to make things much more concrete for the viewer. Rather we are let in on an extraordinary experience, moving between the mysterious faces of a transitional moment in American history, not quite sure whether some greater revelation is bubbling under the surface. The closest Eggleston came to taking traditional portraits was in a series he shot in bars in his native Memphis and the Mississippi Delta in 1973-4. The sitters in his Nightclub Portraits – anonymous figures plucked, slightly flushed, from their nights out – are not posing but instead are photographed mid-conversation, Eggleston capturing them at their most unguarded. What is remarkable about this example is the strange composure of the subject, the slightly ethereal sheen as the flash from the camera is reflected by her make-up. 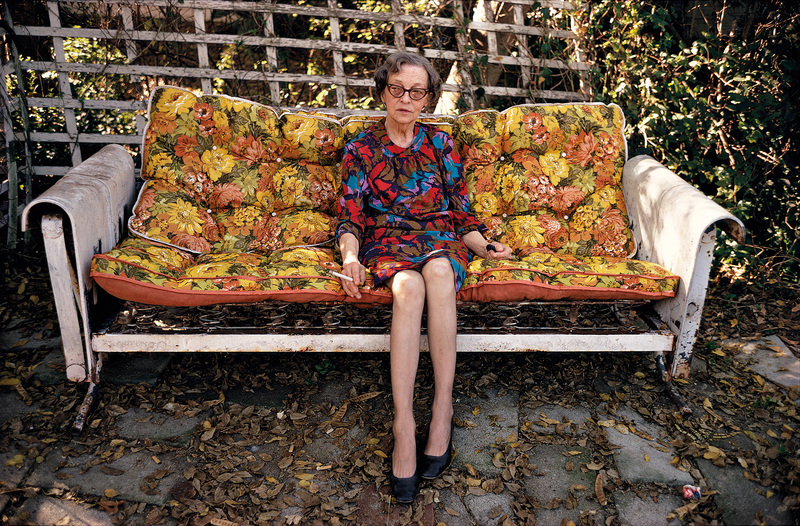 Eggleston’s precise focus picks out the individual threads of her cardigan. Something hyper-real and statuesque emerges from an ordinary night out. Charlie Boynkin, sheriff of Morton, Mississippi, would act as Eggleston’s bodyguard while he did night shoots in the town. Here we see him in his own bedroom, in what appears to be a scene of cosy domesticity. 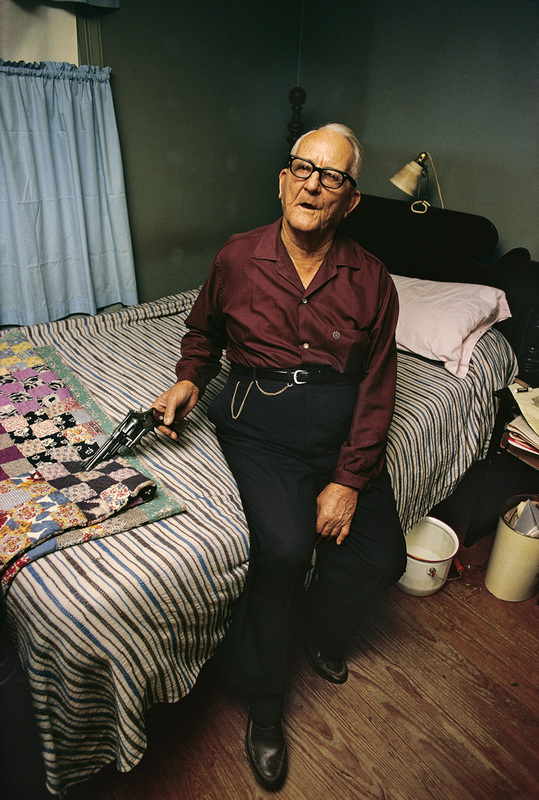 Distracted by the busyness of the bedspread, you almost miss the pistol he is unselfconsciously holding. For a non-American viewer the image could be a potent metaphor for the unspoken violence bubbling under the surface of everyday life – or it could just be an old man settling in after a hard night’s work. 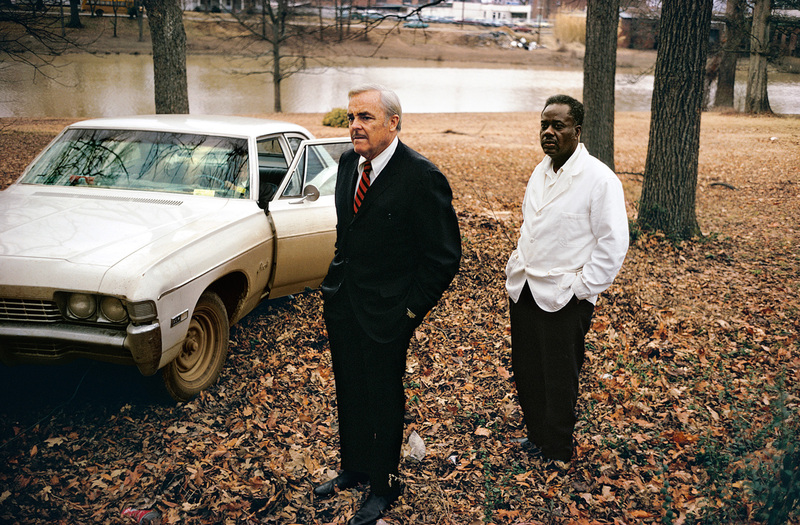 The racial politics of the South are always subdued in Eggleston’s portraits. 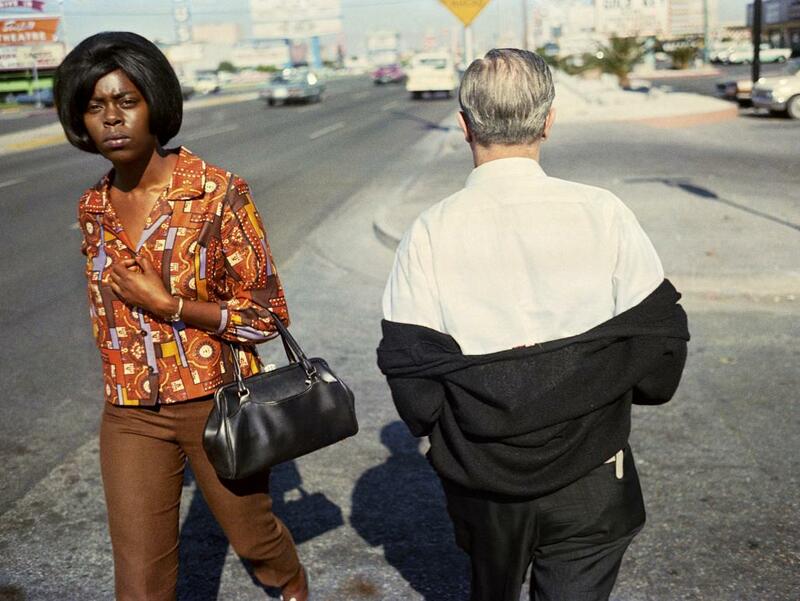 By capturing the gaze of the anonymous black woman here, Eggleston asks as much about the viewer as the viewed. The expression on her face could be read as pinched, suspicious, uneasy; it could also be that the camera just caught her at the wrong moment. In this picture, as in many others, Eggleston makes us question our sense of perspective. 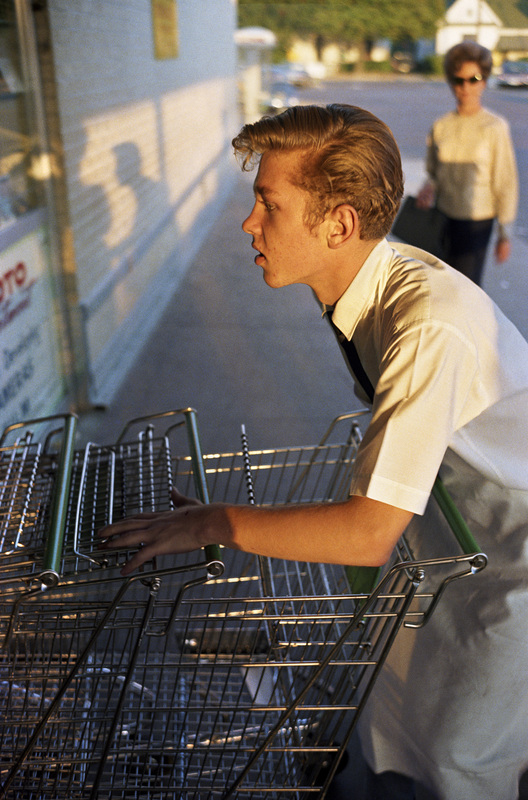 The photo that made Eggleston’s name, this image of a grocery-store boy lining up shopping carts is a prime example of his ability to capture the humdrum reality of life in mid-century America. Yet it is also something more: the delicacy of his motion, the tension in his posture, the concentration on his brow evoke a master craftsman at work. Despite Eggleston’s presence, he seems entirely unselfconscious: caught in perfect profile and sun-dappled like a prime specimen of American youth. Eggleston, hovering between documentarian and sentimentalist, creates a semi-ironic paean to America. Another of the Nightclub Portraits, this picture shows Eggleston’s gift for capturing those enigmatic looks we feel we almost, but don’t quite, recognise. 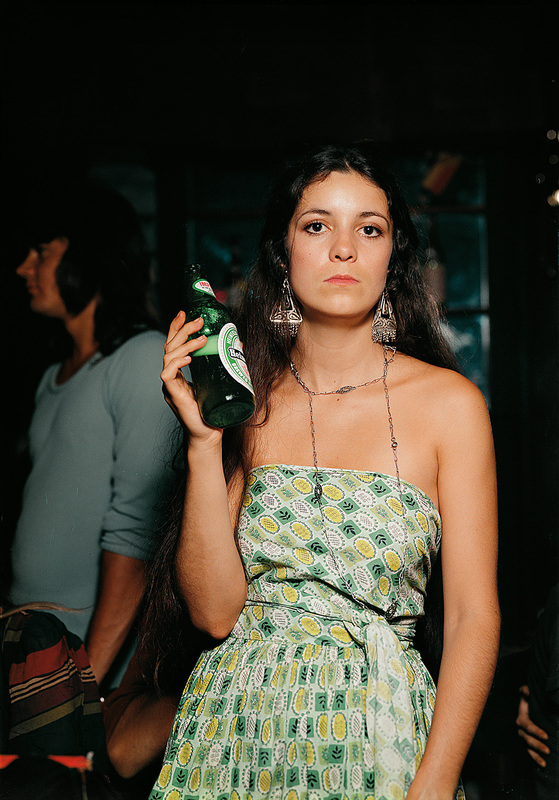 Her slouched posture, the tilt of her beer bottle, the direct gaze: is this something threatening or just bored? The contrast of luminous skin with the pitch-black background and the complementing colours of bottle and dress remind us of a moment from an evening when everything seems to fall into place and a point of drama is about to be reached. For Eggleston this photo is highly personal. Jasper Staples, the figure on the right, had been around him for his whole life as his family’s “house man”. Here he is next to his employer, Eggleston’s uncle, at a funeral. His exact mimicking of his boss’s posture and their shared focus on an event happening off-camera gives them a moment of unity. Yet the composition of the shot, with their balance and the open car door suggesting some ongoing action, is highly theatrical and might even put us in mind of a TV detective show. This photo of Devoe Money, a cousin of Eggleston’s, is a strange one. The clashing colours and patterns of her dress and the cushion on which she sits, the dead leaves, the crushed coke can and the rust of the sofa all play against the idea of a cosy family portrait. Money is swamped by the sofa, made small yet still poised and intelligent, a relative somehow familiar to any viewer. It’s a portrayal of a real flesh and blood family member. One of Eggleston’s most famous images, this pictures shows why he is known as the man who brought colour photography into the artistic mainstream. The subject, Marcia Hare, floats on a cloud-like bed of soft-focus grass, the red buttons on her dress popping out like confectionary on a cake. The dye-transfer technique which Eggleston borrowed from commercial advertising and turned into his trademark gives such richness to the colour that we are brought out of the Seventies and into the realm of Pre-Raphaelite painting. The ghost of Millais’s “Ophelia” sits just out of reach, a connection which the inscrutable artist is happy, as ever, to neither confirm nor deny.